More about my tardiness in publishing updates … in the next update. You’ll probably remember that our son, Caleb, has a number of food allergies. It’s especially easy to recall this fact if you’ve ever had us over for dinner. Broadly speaking, one of those allergies has been tree nuts, which includes things like cashews, pistachios, pecans, and more. We’ve know for several years that he is not, however, allergic to pecans in particular. He was tested specifically for this because we had two large pecan trees in our backyard in Texas. That could’ve been awkward. Our boy has been through a number of tests with an allergist here in Germany. Some of them have been better experiences than others; Katherine would be the better storyteller on that score. But in the latest round, the allergist encouraged Katherine to do some testing at home as a result of low, low numbers in Caleb’s blood tests (IgE levels). Home is more comfortable. The test subject was to first try chopped hazelnuts baked into food. (Eating something baked, versus raw, can reduce the possibility of a reaction.) Then we were to watch for the usual symptoms. So the test preparer, namely Katherine, prepared something delicious with hazelnuts bought in the shell. And then the test subject ate said delicious somethings. We watched, and watched, and watched, but he did not react to the nuts. 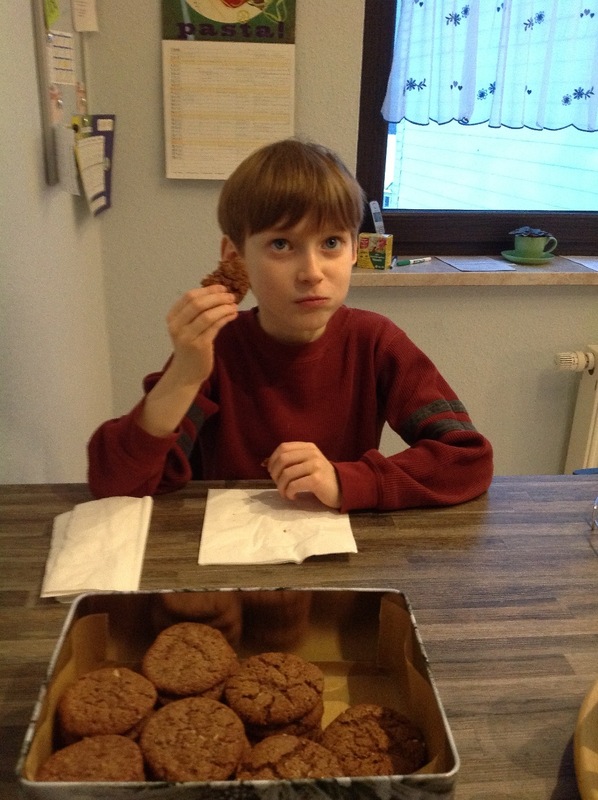 He did react to the deliciousness, though, but not in any way that would concern an allergist. Over the span of a few weeks, Caleb was to keep eating things with hazelnuts in them. Poor boy … so many yummy muffins and cookies, and so little time. Now he eagerly cracks them open himself and pops them in raw, and we now have a new source of protein (and much-needed fat) for him. He’s been through the same routine, successfully, with almonds. We’re equally happy for that, too, but almonds are terribly expensive here. Whether you’ve ever had to prepare food for our son or not, please be thankful to God with us for this change in Caleb’s life. He is, and he has the crumbs to prove it! For four weeks now, Caleb has been eating a food that was previously off-limits: wheat. Blood tests done in the U.S. last year indicated that he was much less likely to develop a reaction to it. However, there was not enough time to follow those tests with a food challenge. Working through a new contact – and subsequent friend – here in Germany, Katherine made an appointment with an allergist at the children’s hospital run by the German Red Cross in nearby Siegen. Based on the exam and a review of the test results, the allergist recommended that a food challenge be done. Early last month, the clinic applied a test that didn’t go so well. The poor lad had to drink quite a lot of two not-so-smoothies to get enough wheat (plus a control) into his system. At the end of the testing, he just couldn’t keep it all down. Over the next few weeks, Katherine tried additional wheat foods and increased the amount that our very happy boy was eating. There was still no reaction. With four weeks behind us, it seems that Caleb is in the clear! Katherine discovered during this time that an area bakery, which is based within a very short walk of our home, keeps a thorough catalog of their products. It lists all of the ingredients for each item. If there’s a possibility that the product contains trace amounts of any of the common allergens, the catalog lists that, too. With that information in hand, Katherine got Caleb a treat – his first soft pretzel! We are ecstatic that Caleb is free now from an allergy that put some of the most severe restrictions on his diet. Our thanks go to the LORD our God for hearing our prayers – and those of family and friends – over these many years. He has taken soy and wheat off of Caleb’s list now, with only milk, eggs, peanuts, and (most) tree nuts still out-of-bounds. Praise God with us for this wonderful development! Please keep praying for our boy’s allergies and health, when you think of it. Who knows but that we may soon see more of these allergies fall by the wayside? For the past few years, Caleb has had blood tests done to see if his sensitivity to any of his food allergies has subsided. This year, there was an indication that it would be a good time to test him directly on soy. Yesterday, Katherine took him up to the allergist’s office, where he was given a little soy milk to drink under the observation of the doctor. After several small drinks of the stuff – which, amusingly enough, he disliked – and a few hours’ time, he had not reacted. By bedtime, there was still no reaction. This morning, Caleb had no signs of his usual symptoms. If he’s clear tomorrow, after the 48-hour mark, then he can start trying measures of soy foods on a regular basis. What an answer to prayer this would be! It’s difficult enough for Katherine to accommodate his allergies here in the U.S., but it will take research and special language study to ensure that we can provide for his diet in Germany. Don’t stop praying!